It was a wonderful weekend for Jess and Wells’ Savannah wedding on Wilmington Island. We started our weekend with photographing their rehearsal dinner in the backyard of a private home overlooking the river. 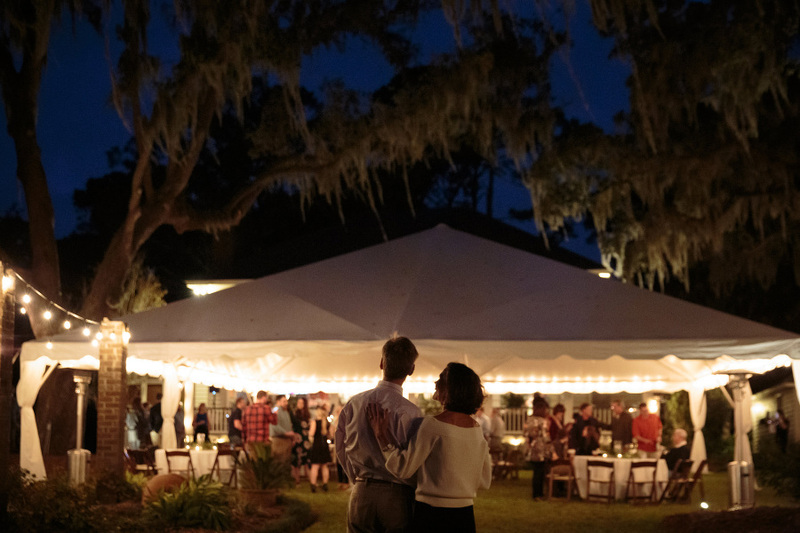 Guests enjoyed an evening on the marsh enjoying games like giant Jenga and corn hole while mingling with other guests and indulging on a low country boil dinner. At the end of the evening, our bride and groom’s family and friends shared stories of their memories of the couple and even surprised them with an impromptu flash mob. The next morning our bride and groom’s prepared for their wedding day at neighboring houses on Wilmington Island. Our couple exchanged vows in the overlooking the marsh under a custom arbor that was created by the father of the groom. The evening continued with cocktails, dancing (thanks to Amp’d) and spectacular food on the lawn of the private home. Guests even had the opportunity to enjoy a coffee from a specialty truck brought in for the occasion. At the end of the evening, Jess and Wells exited their reception through a tunnel of sparkers off to their wedding day. Congratulations Jess and Wells!